The following describes the power supply that comes with Xbox One S and original Xbox One, including info on placement, temperature, noise, and safety. Xbox One S and original Xbox One come with an external fan-assisted power supply that measures 6.69 x 1.88 x 2.96 inches (about 17 x 4.8 x 7.5 cm). The size is the same in the 100-110V, 220-240V, and 100-240V versions. Microsoft does not license any non-Microsoft accessories that plug into the Xbox One power socket. Using any accessory other than the standard Xbox One power supply may damage your Xbox and void your warranty. Xbox power supplies should be used only in the regions where they’re sold new. Don't use a power supply built for a region whose power requirements differ from where you are. Don't use an unlicensed accessory, such as a non-Microsoft replacement power supply, or any accessory that plugs in-between your Xbox and its power supply. The Xbox power supply contains a fuse to help protect your console from power surges and excessive voltage. This fuse can’t be replaced. 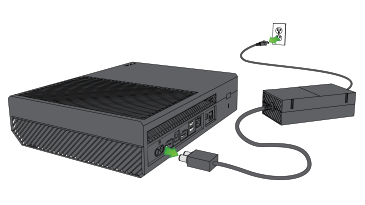 The Xbox power supply uses a hard-wired, direct-current (DC) power cord that plugs directly into the Xbox. The DC power cord is about 3 feet, 6 inches (1.1 meters) long. A proprietary power connector is permanently attached to the end of the DC power cord. This connector is designed specifically for power sockets on Xbox One S and original Xbox One. The power supply connects to a wall socket using a detachable AC power cord. The AC power cord is about 5 feet, 9 inches (1.2 meters) long. Using a power cord other than the one designed for your power supply may damage the power supply and your Xbox. The type of plug that connects the power cord to your electrical outlet depends on the country and region where your Xbox was sold new. The power supply has a built-in cooling fan. The fan starts automatically when you turn on your Xbox. The fan should make a noticeable whirring sound typical of most cooling fans. When your Xbox is in energy-saving mode or when it’s disconnected from its power supply, the fan is turned off. If your Xbox power mode is in Instant-On, the power supply and fan will remain turned on. The fan speed increases or decreases, along with the sound of the fan, as the power supply changes temperature. Don't block the power supply’s vents. Don't leave the power supply on a bed, sofa, or other soft surface. Make sure the power supply has good air flow. Don't put it inside a bookcase, rack, or stereo cabinet unless that space has good ventilation. Don't leave the power supply near heat sources such as a radiator, heat register, stove, or audio equipment. Don't stack electronic devices on top of the power supply. Position the power supply horizontally so it sits flat on its rubber pads. If noise from the power supply seems excessive, the power strip or surge protector it’s plugged into may be overloaded. Plug your Xbox power supply directly into a wall outlet instead. Fully insert the DC power cord into the console. Firmly plug the AC power cord into the power supply. Plug the other end of the AC power cord into a wall outlet. As with other electrical devices, failure to take precautions can result in severe injury or death from electric shock or fire. Not taking precautions can also damage your video game and your Xbox. Use only the power supply and power cord included with your Xbox or provided by an authorized repair center. If you need a replacement power supply or power cord, contact Xbox Support. Make sure your electrical outlet is the same voltage (V) and frequency [Hz] of power as shown on the power supply. If you’re not sure what type of power is supplied to your home, ask a qualified electrician. Don't use non-standard power sources such as generators or inverters, even if the voltage and frequency appear correct. Use only AC power from a standard wall outlet. Don't overload your wall outlet, extension cord, power strip, or other electrical receptacle. 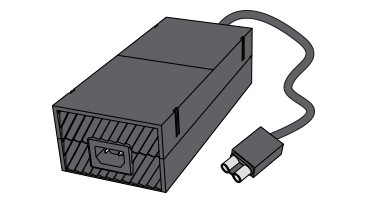 Confirm that these are rated to handle the total current drawn by your Xbox (as shown on the power supply), and by any other devices on the same AC circuit. Use a properly grounded electrical outlet that accommodates the power supply’s three-prong grounding plug. Do not remove the grounding plug or use a grounding adapter that circumvents the grounding plug. If the plug doesn’t fit your outlet, have an electrician replace the outlet. Prevent power cords from being walked on. Protect power cords from being pinched or sharply bent, especially where they connect to the power outlet, the power supply, and your Xbox. Don't jerk, knot, sharply bend, or otherwise mishandle power cords. Don't expose the power cords to heat sources. Don't wrap power cords around the power supply. Keep children and pets away from the power cords. Make sure they don’t bite or chew on the cords. When you disconnect the power cords, pull out by the plug, not the cord. Don't let the power supply hang suspended from either power cord. If a power cord or the power supply becomes damaged in any way, stop using it immediately and contact Xbox Support for a replacement. Unplug your Xbox during lightning storms or when it won’t be used for a while. Would you like to contact Support regarding the "About the Xbox One power supply" issue you were reading about or a different issue?